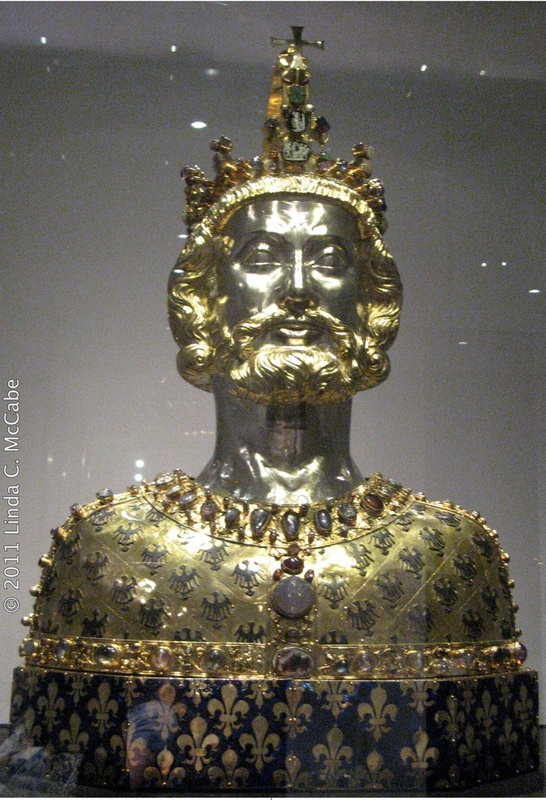 A reliquary of Charlemagne containing his head. 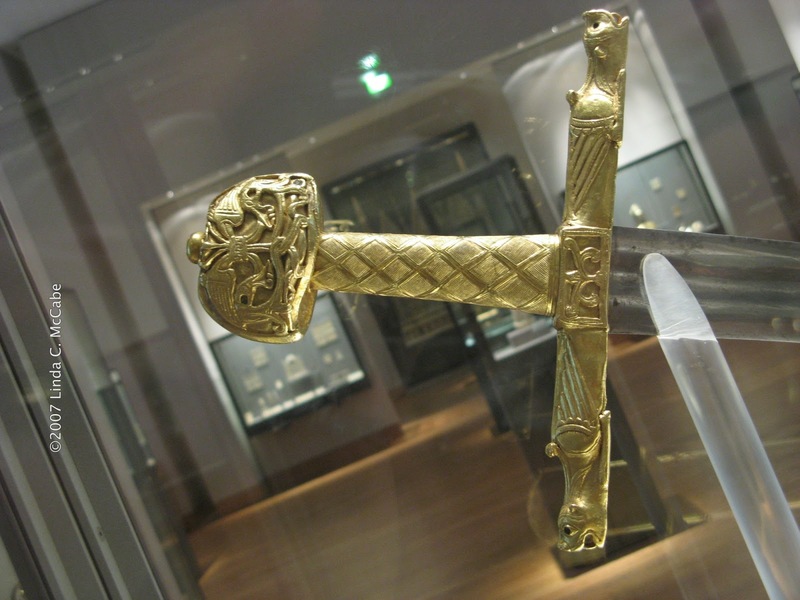 This is found in the cathedral treasury in Aachen, Germany. 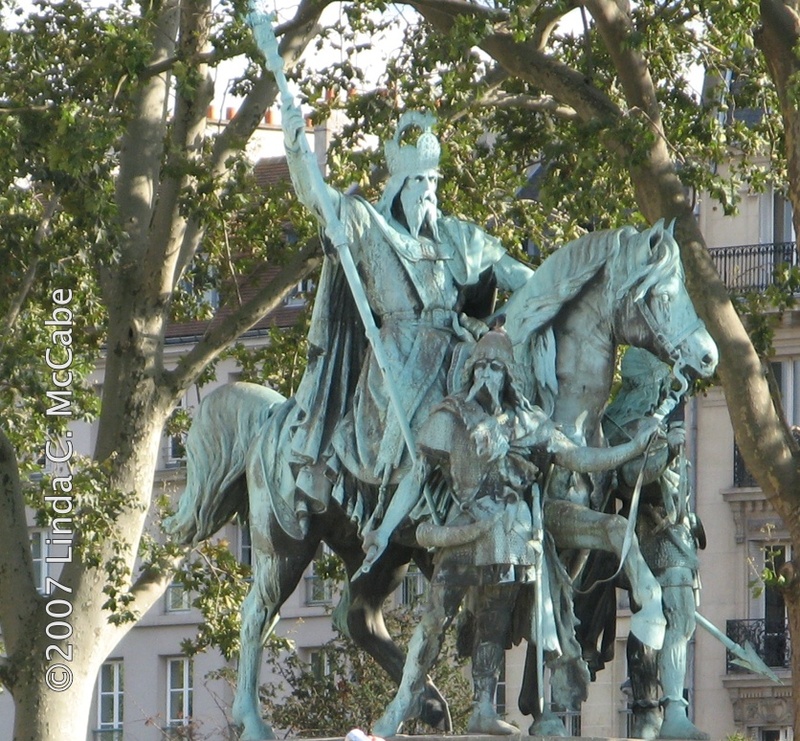 In honor of the 1199th anniversary of Charlemagne's death, and in anticipation of the major anniversary to be celebrated next year, I wanted to write a post in honor of that historic leader who changed Europe. His date of birth is reported as April 2nd, but the year is in some dispute. Encyclopedia Britannica has it listed as 747? while his official biographer Einhardt suggests he died at age 72 making his birth year as 742. There is not any dispute as to when he died. 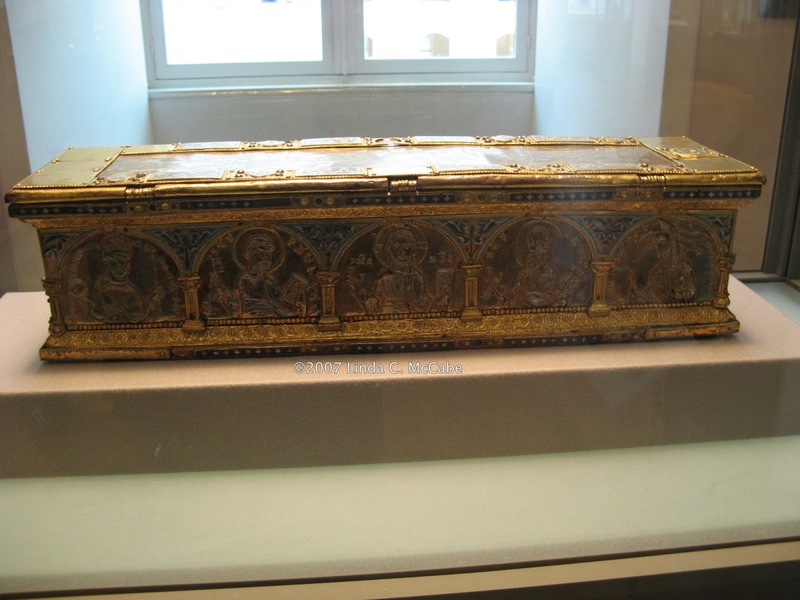 I have snapped pictures associated with Charlemagne ever since beaming a devotee of Carolingian legends. I wanted to share some of them with my blog readers. Staring in Paris, there is a statue of him in front of Notre Dame Cathedral. 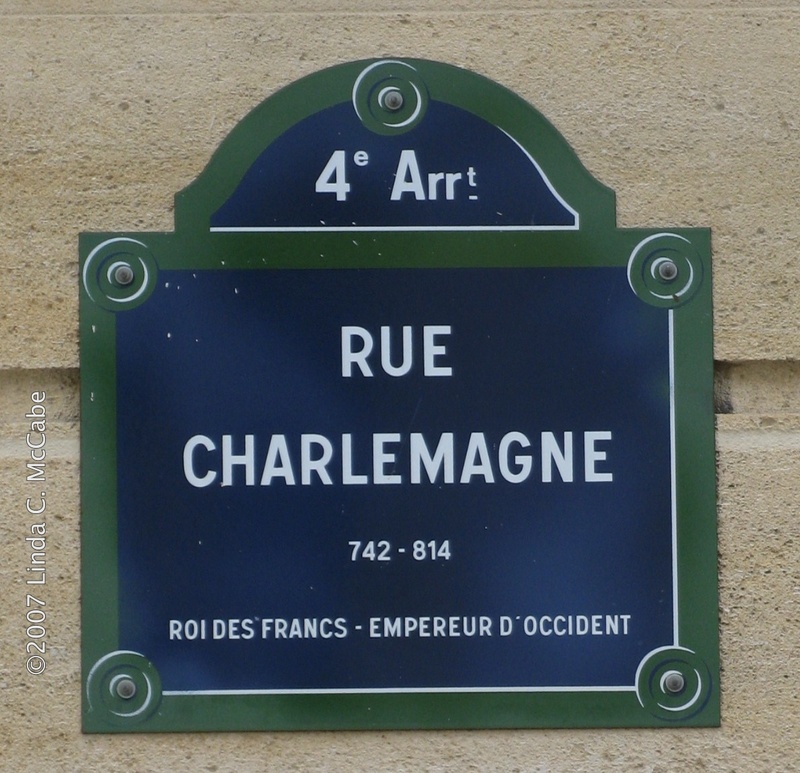 Then on the Right Bank is Rue Charlemagne. 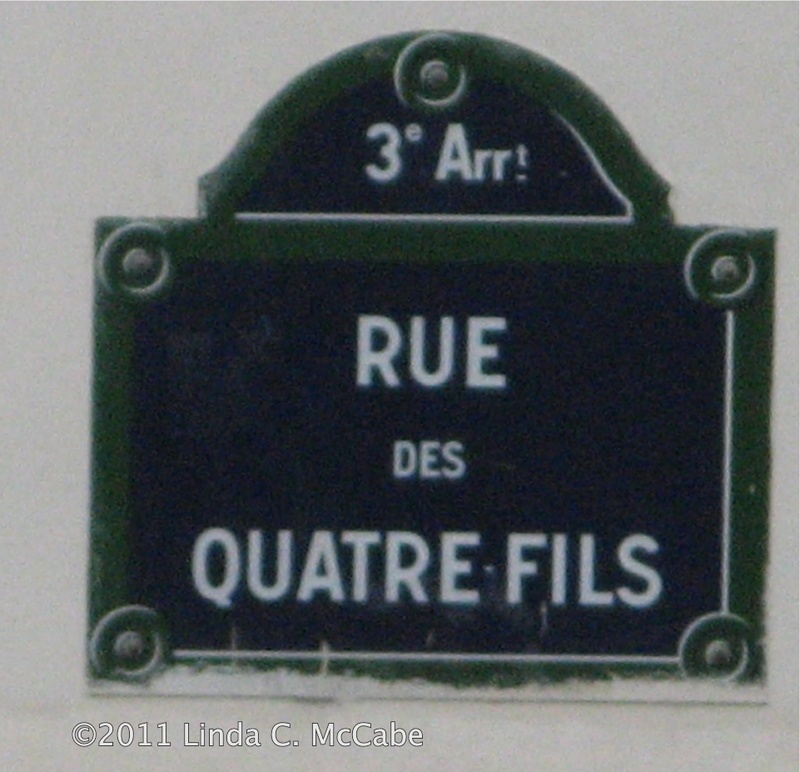 I was delighted to find that his street intersected with one named after his biographer, Rue Eginhard. There was also a bookstore named after him a few blocks away. 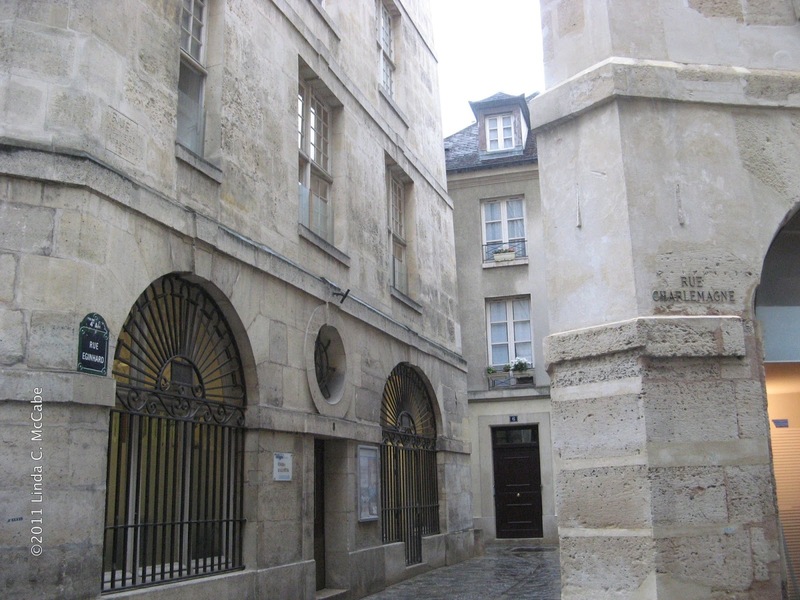 Not far from the Musée Carnavalet is a street named after the famous poem Les Quatre Fils Aymon. 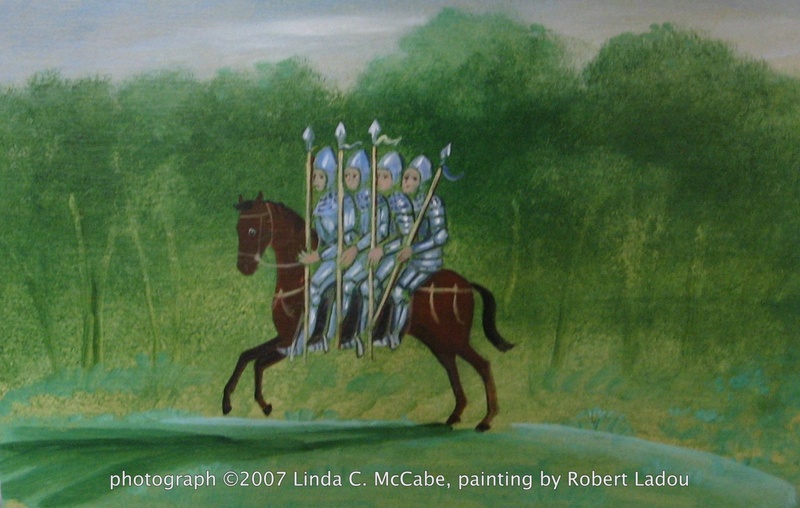 Then in Chantilly, a chateau north of Paris I found a painting depicting those four sons of Aymon riding on the back of Renaud de Montauban's coveted destrier Bayard. Too bad the artist did not have Renaud sporting Mambino's golden helmet. Then we would know for certain which of the four brothers was Renaud. 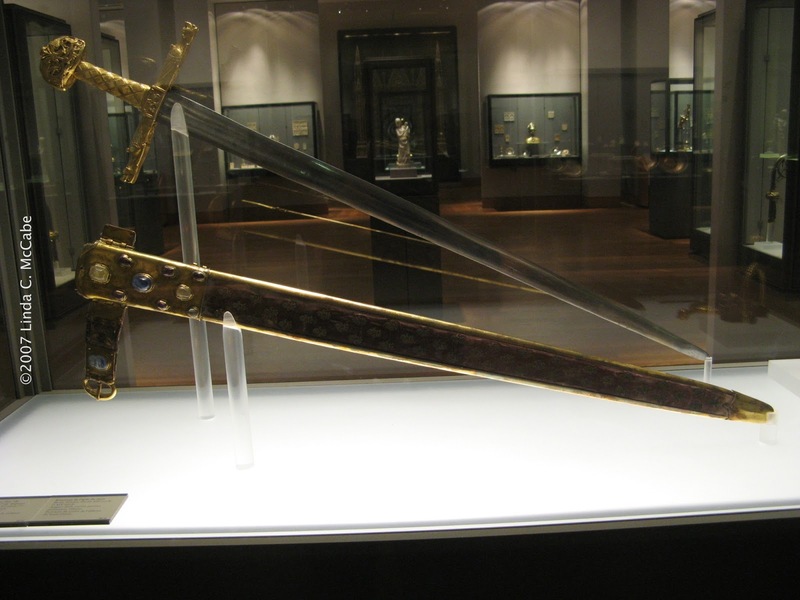 but a replica of his famous sword Joyeuse. 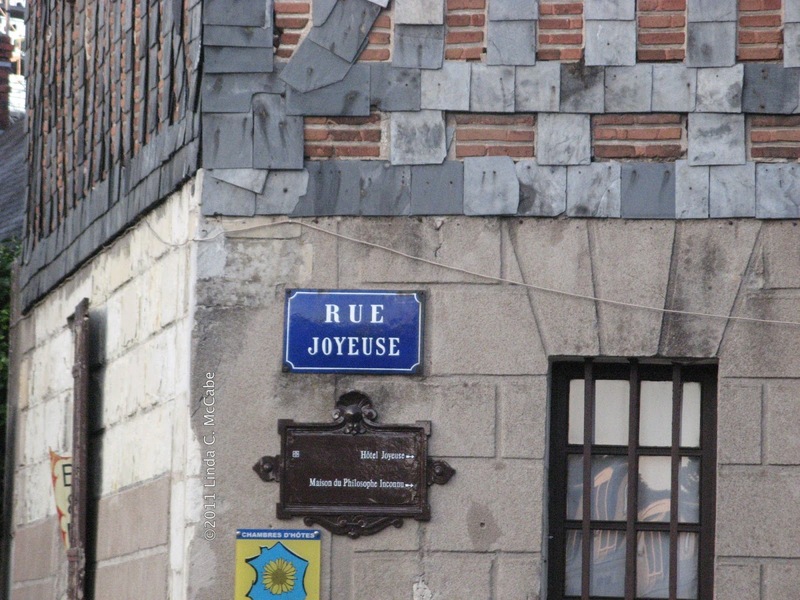 While in Amboise, I noticed Rue Joyeuse. 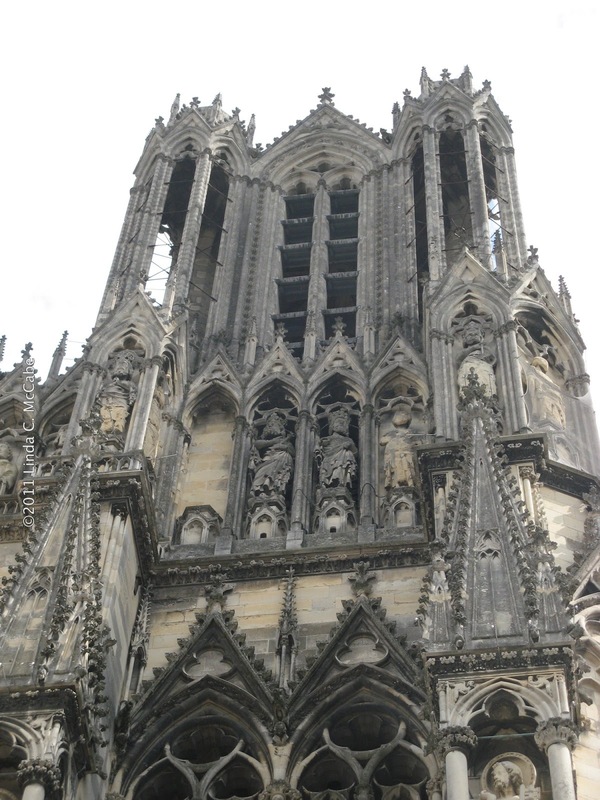 In Reims, the treasury for the cathedral had a statue of Charlemagne that had been taken down because it has deteriorated and needs a replacement. Here I am providing perspective as to its size. 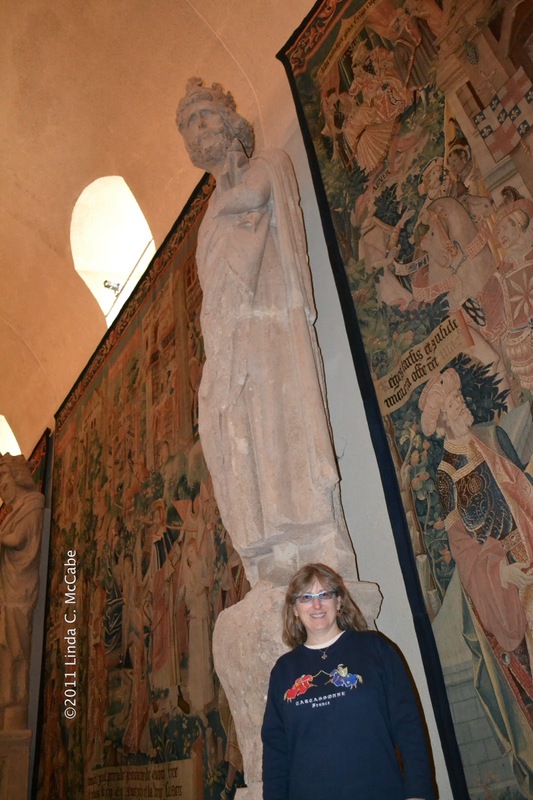 Plus, I wanted a picture taken of me with Charlemagne. 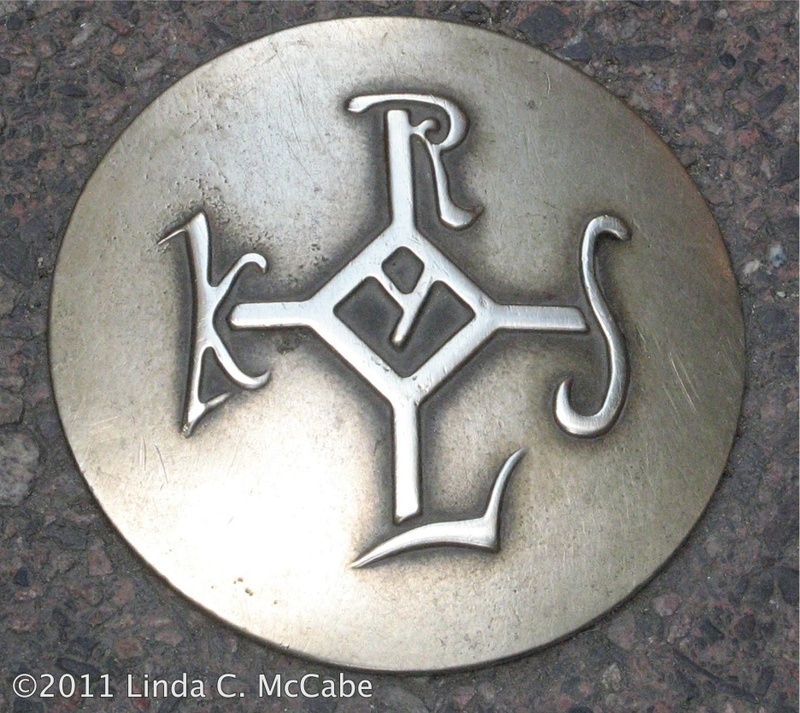 Here is where I believe it had been placed on the cathedral. You can see the empty pedestal. 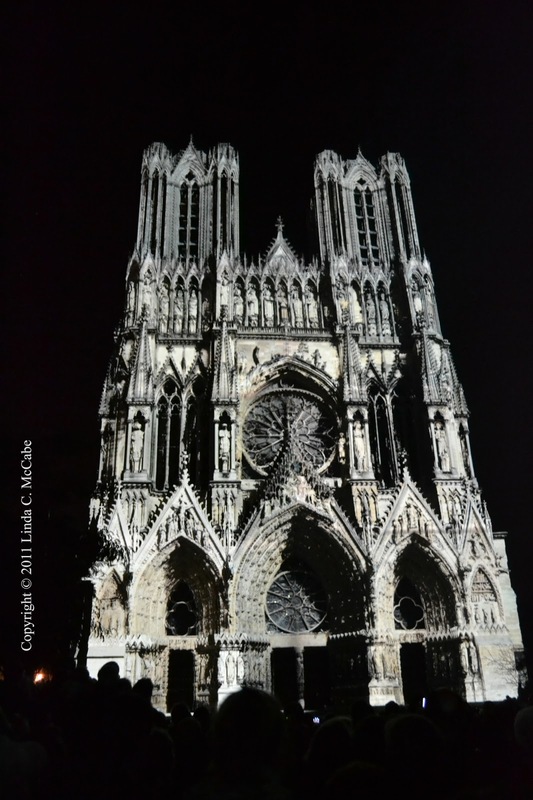 It is not so obvious when you look at the cathedral as a whole. 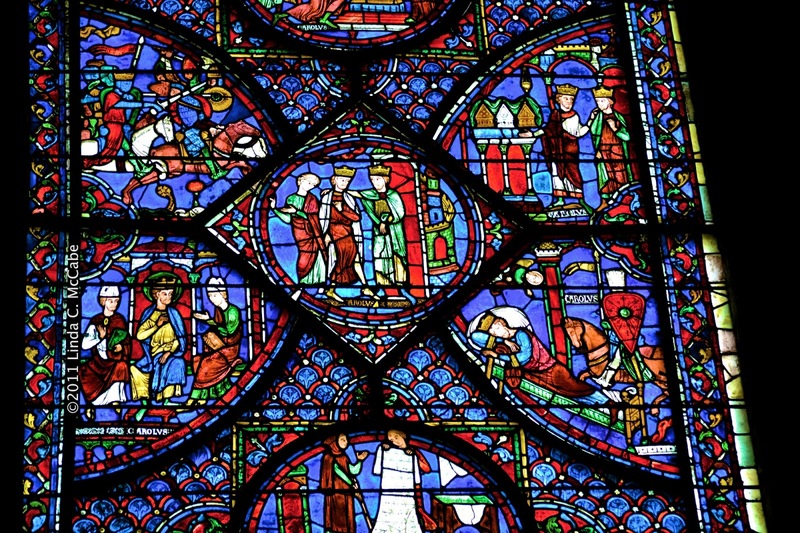 Speaking of cathedrals, there is an entire stained glass window devoted to the legends of Charlemagne at the cathedral in Chartres. 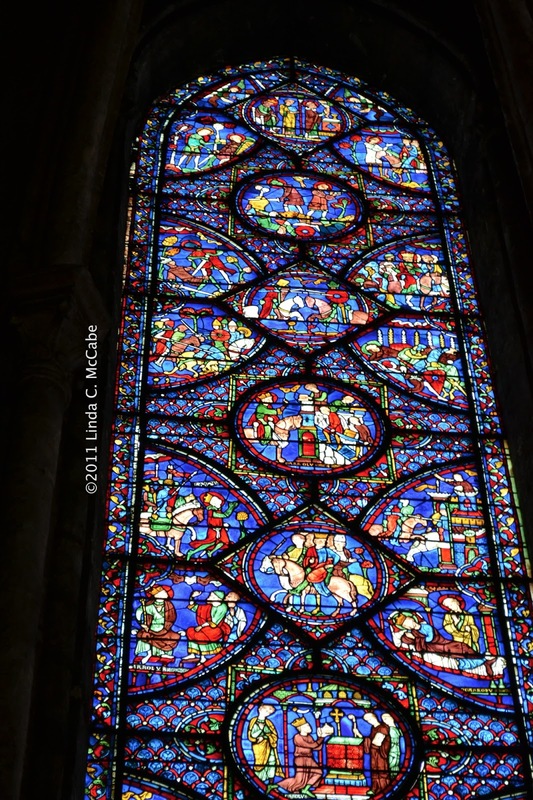 If you are wondering how someone can tell that this window is about Charlemagne and not just any king, you can see if you look closely the word Carolus used in many of these insets. 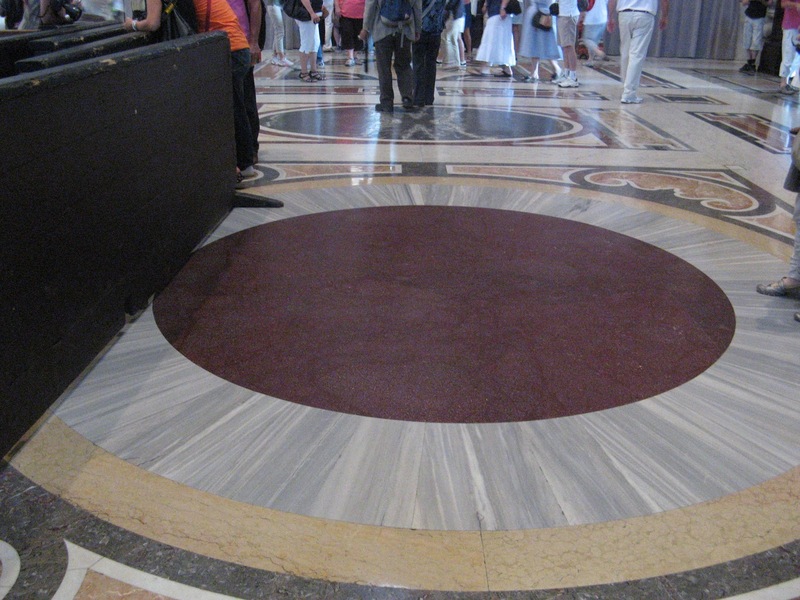 During a trip to Italy in 2011, I arranged a tour of St. Peter's Basilica because I wanted to see where Charlemagne had been crowned as emperor of the Western Roman Empire on Christmas Day in the year 800. 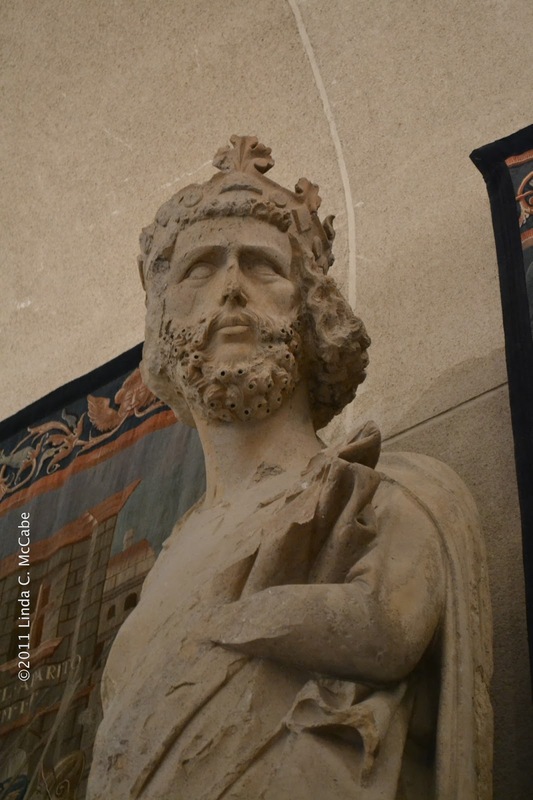 Outside the entrance to St. Peter's stands a large statue of Charlemagne. 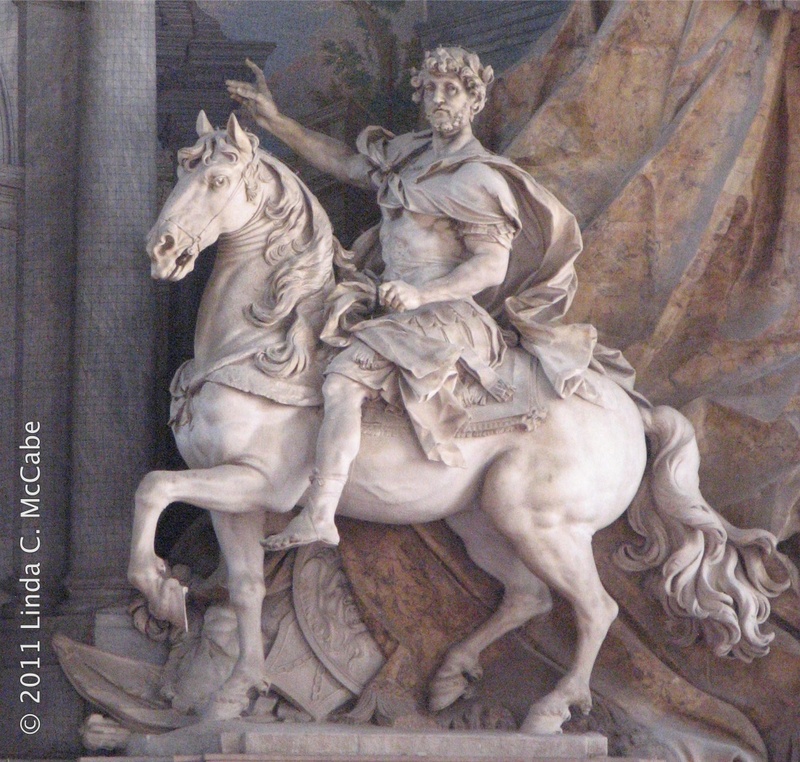 There is a companion statue of Constantine facing Charlemagne, but I never even looked his way. So I do not have a picture of that to share. 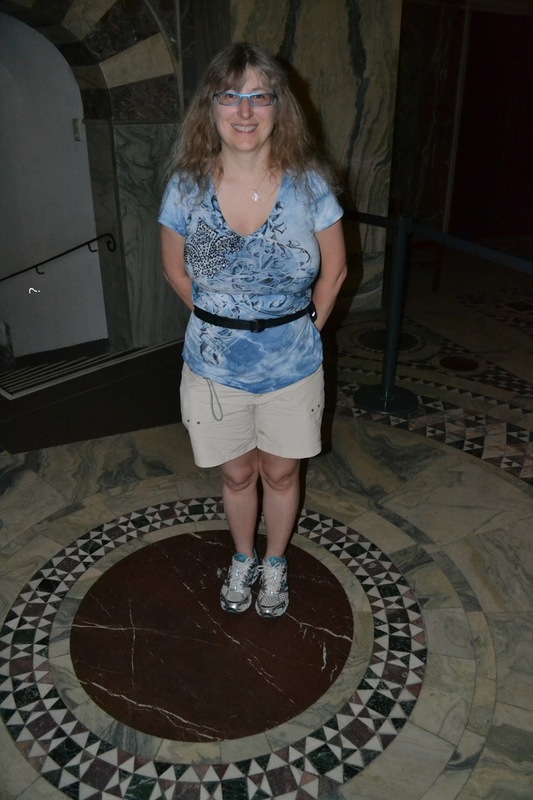 Inside the basilica, my tour guide showed me the very spot Charlemagne was crowned. It was upon a disk of red porphyry. My guide stressed that red porphyry was expensive and had been mined from a single mine in Egypt, but had been long since been exhausted. 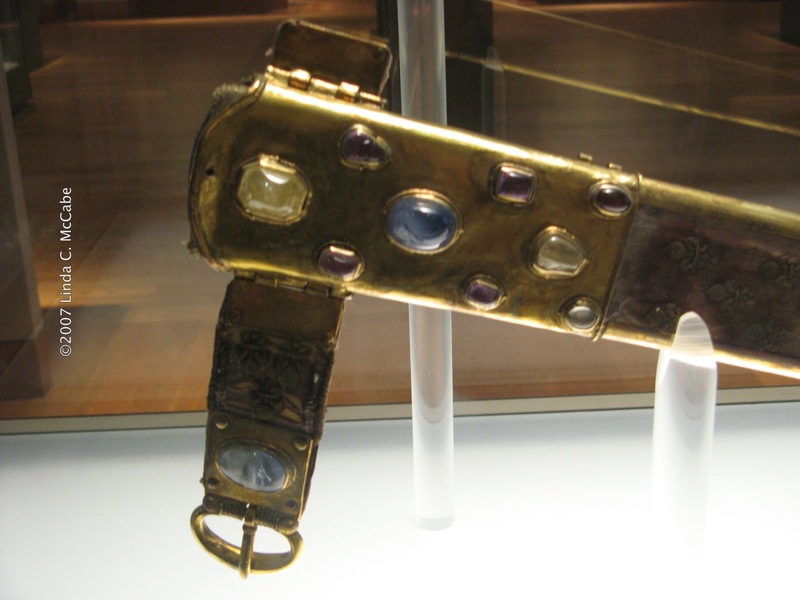 This made the existing porphyry all the more valuable. I then started taking pictures of red porphyry where ever I saw it. 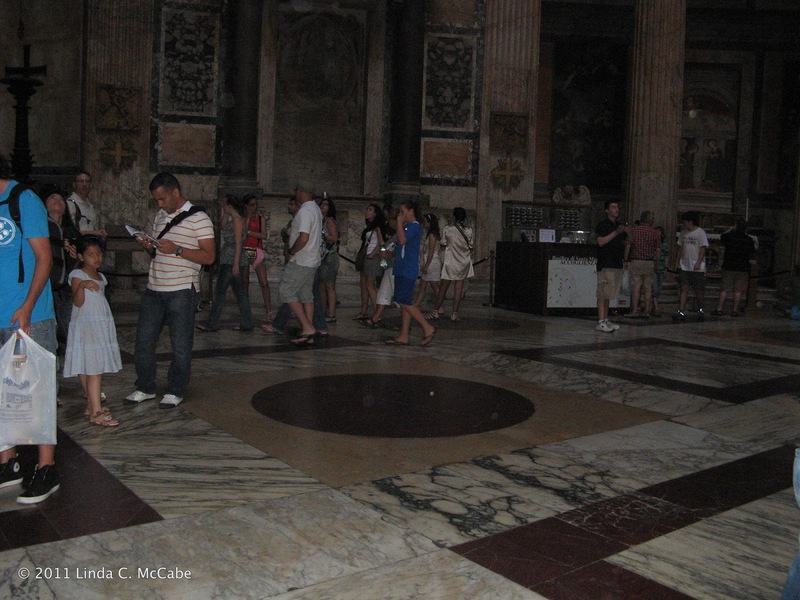 Here is one in the Roman Pantheon. And a close up of that disk. Then in August 2011, I visited Aachen. The capital of Charlemagne's empire. 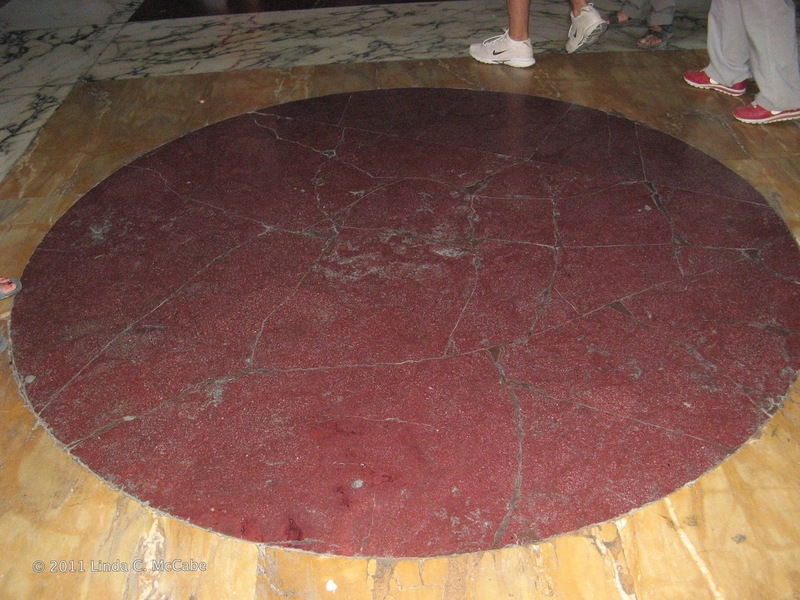 This time when I saw a disk of red porphyry inside his cathedral, I made sure to have my picture taken standing on it. 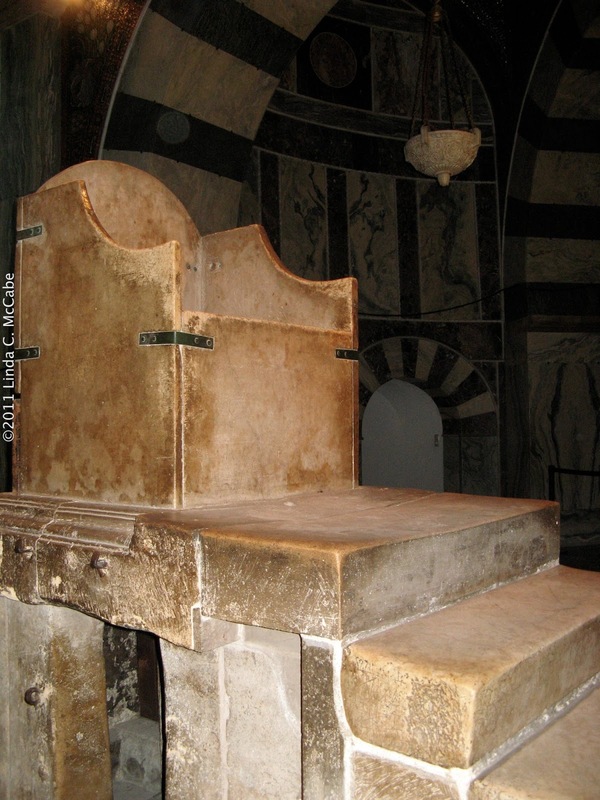 Here is his throne which was on the second floor in the cathedral. There are steps leading up to the throne and pilgrims used to crawl under it. 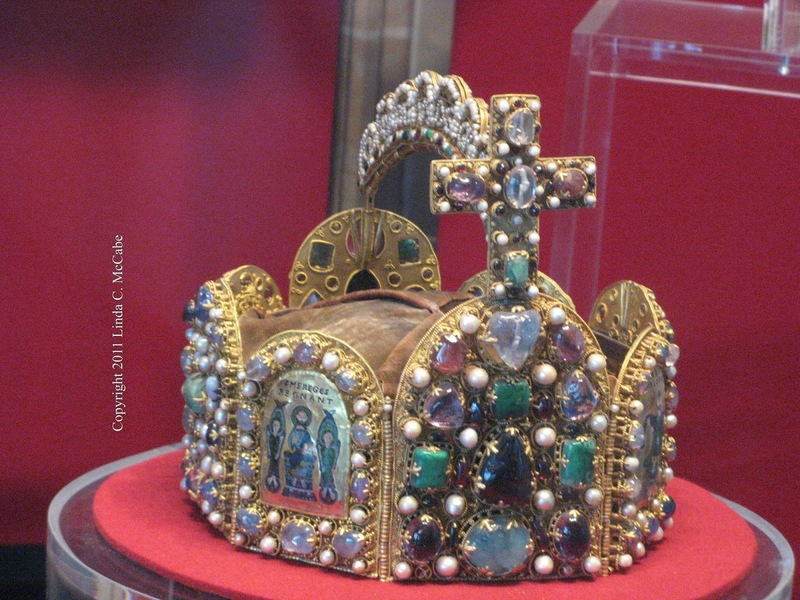 Here is a replica of his crown that is in the Rathause, a building where the current Aachen City Council meets and where Charlemagne's palace once stood. 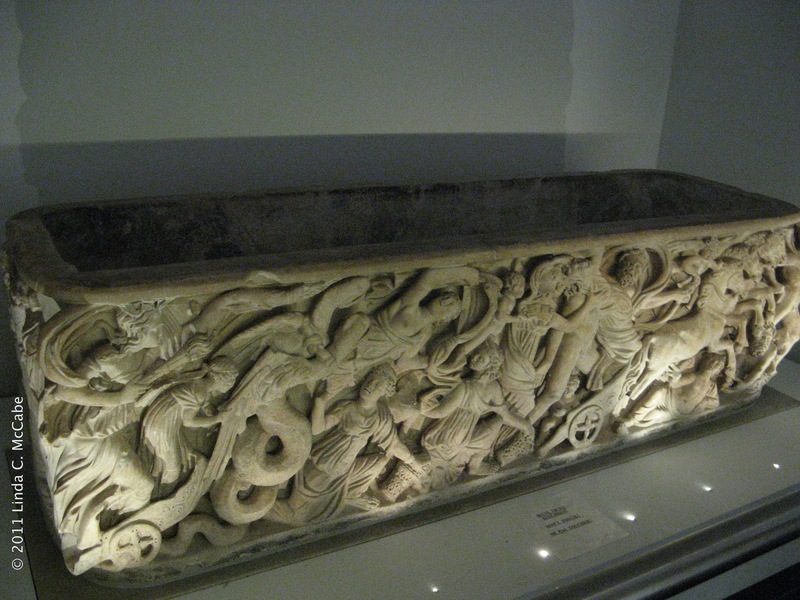 He was originally buried in this sarcophagus that is now housed in the cathedral treasury. 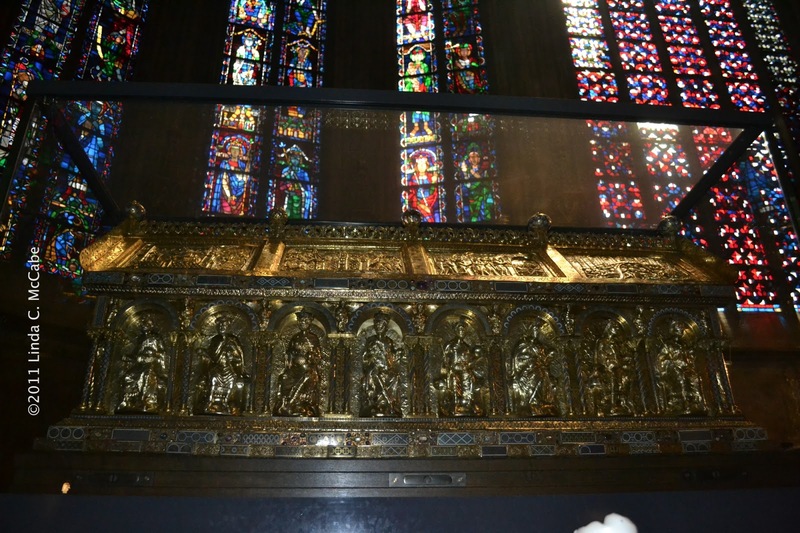 However, when he was canonized, they removed his remains and placed several portions in small reliquaries (like the golden head at the top of this page and the arm held in the Louvre) and the bulk of his bones inside a golden reliquary inside his cathedral. 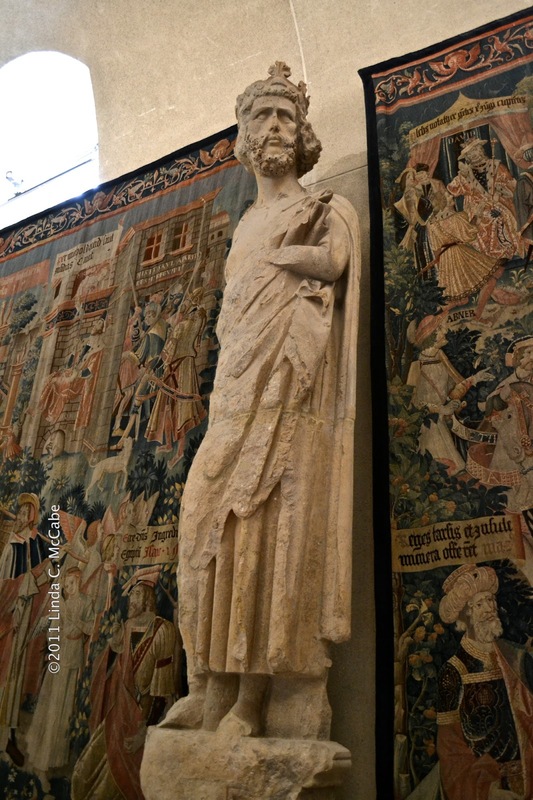 In Aachen, Charlemagne's influence can be found everywhere. Including his monogram found on the streets. I hope to make it back to visit Aachen next year and see some of the festivities planned for such a significant anniversary of the death of an important leader in history. 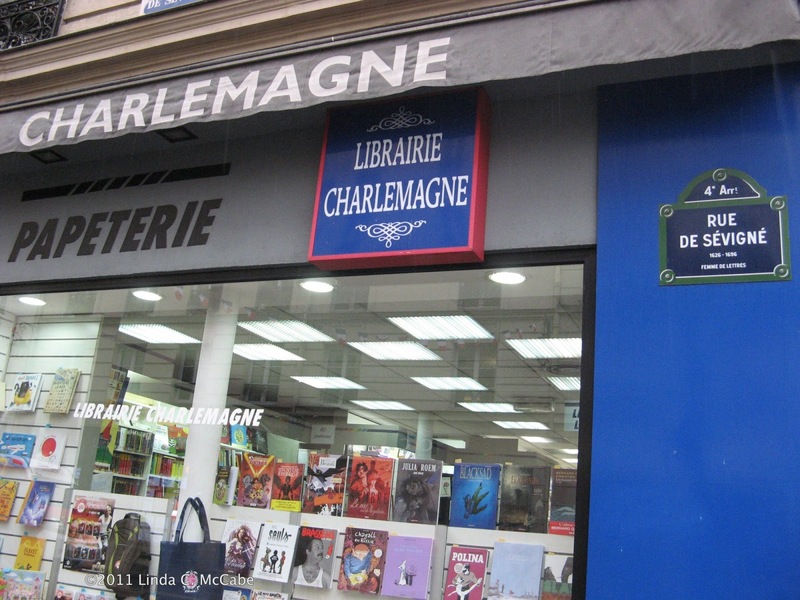 Perhaps I will be lucky to be asked to participate as an author whose work's purpose is to inspire a new generation to discover and enjoy the legends of Charlemagne.